BOZEMAN — Jeff Choate has had an agenda ever since watching and listening to DeNarius McGhee and Cole Moore talk to prospective Bobcats. 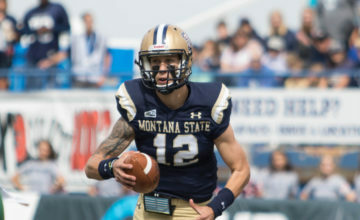 McGhee, the 2010 and 2012 Big Sky Conference Offensive Player of the Year and one of just 14 quarterbacks in college football history to throw for more than 10,000 yards and rush for more than 1,000, is currently Montana State’s running backs coach and MSU’s primary recruiter in his native Texas. 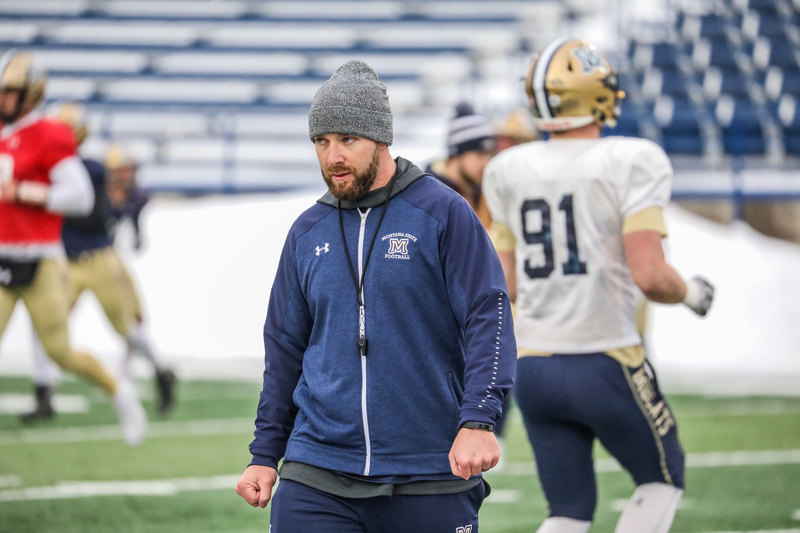 Moore, a walk-on quarterback turned All-Big Sky linebacker who served as one of MSU’s captains as a senior in 2014, is Montana State’s football operations director. He handles a good portion of the logistics of MSU’s recruiting efforts. Choate’s first staff at Montana State included Kane Ioane, a pillar of the program since his days as the star of Mike Kramer’s Bobcats. Choate hired Moore as his administrative assistant in Year 1. Choate added McGhee to the staff before his second season initially to work with quarterbacks, namely raw sophomore Chris Murray. 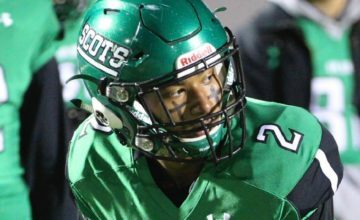 One of his first calls went to Bobby Daly, a former MSU All-American linebacker who was Ioane’s first outstanding pupil back in the mid-2000s. At the time, Daly was the director of football operations at Idaho. He’s spent the last two seasons coaching defensive line, then inside linebackers. “I had a conversation with him really out of respect for him, knowing who he was when I first got hired,” Choate said. “I called him and said I had my guys in mind, not going to hire you this time. But he coached at Idaho and I have a lot of connections and ties up there (Choate is from Saint Marie’s). I was at a clinic and he came by. (former Bobcat defensive end) Dane Fletcher got married and I saw Bobby and his now wife Jasmine at their wedding. So when defensive coordinator Ty Gregorak resigned, Choate hired Ioane as his new DC and Daly as the first linebackers coach not named Kane or Ty at MSU in nearly 20 years. 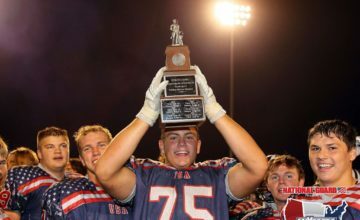 Daly earned 2002 Class AA Defensive Player of the Year while leading Helena Capital to the state title his junior year and a repeat first-team all-state selection as a senior. Despite the fact that this father, J. Daly, was a captain for the Bobcats in the 1970s, Daly still had to walk on. By 2005, he was a redshirt freshman starter who piled up 42 tackles, seven tackles for loss and three sacks on MSU’s Big Sky Conference championship team. In 2006, Daly led the Big Sky and earned first-team all-league honors by totaling 121 tackles, 12.5 tackles for loss, five sacks, an interception and forcing two fumbles. He was a consensus first-team All-American and finished sixth in the Buck Buchanan Award voting given to the best defensive player in the FCS. He had 10 tackles, two sacks and two tackles for loss in MSU’s second-round playoff game at eventual national champion Appalachian State. 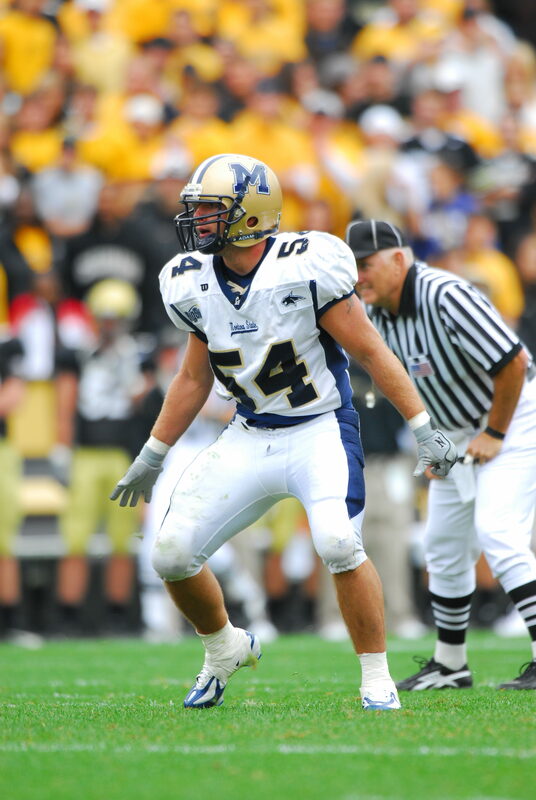 In 2007, Daly piled up 135 tackles, including 75 solo tackles, 15.5 tackles for loss and 5.5 sacks. He also forced two fumbles and earned second-team All-American honors. And in 2008, he had 86 tackles, 8.5 tackles for loss and 3.5 sacks. 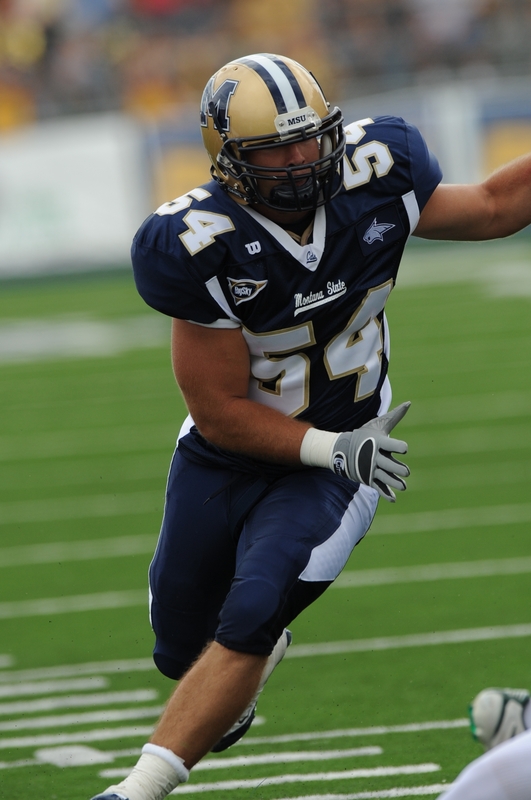 His career total of 382 tackles ranks fourth in Montana State history. His 36.5 tackles for loss is among the best totals ever for a Bobcat. “The great thing about Bobby is not only was he a great player — and there’s a stigma out there that great players don’t necessarily make great coaches — but with Bobby, I had already seen him work as far as the coaching side of things even back when he played,” Ioane said. 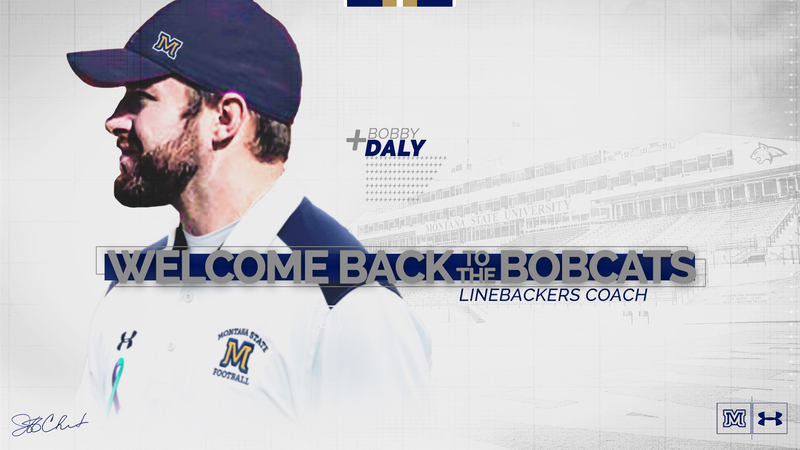 That ability to see the whole picture combined with a relentless motor and a undying passion for the Bobcats — “This is something that has been very important to me my entire life,” Daly said earlier this month — helped the former walk-on transform into one of the great linebackers this century to suit up at Montana State. It’s an experience he hopes to relate directly to his players. “There’s walk-ons everywhere but growing up in Montana is a little bit different,” Daly said. “You grow up either a Bobcat or a Griz fan and you want to be a part of that program that you’ve grown up liking. I was fortunate enough to have the opportunity to be a part of the program. It was as a walk-on. But I knew having looked around at the different guys in my class who were being recruited that were considered scholarship athletes, I grew up playing against these guys my whole life. “There was no doubt in my mind that I could compete with these individuals. Getting on campus as a walk-on linebacker, there was, I believe three scholarship linebackers in my class. Going through drills and watching them do things, I just had a little bit of confidence in me. At a young age, I knew I was better than this guy, better than this guy, better than this guy. I just had to get on the field and get the opportunity to prove it. Daly played for the Billings Outlaws in the Indoor Football League for three seasons, also beginning his coaching career at Bozeman High when available. He was on Troy Purcell’s staff when the Hawks claimed their first Class AA title since 1917 with an undefeated run in 2010. In 2013, he took a graduate assistant position on Paul Petrino’s staff at Idaho. By 2016, he was the director of operations for a Vandals squad that won nine games. Idaho’s best season during its 21-year run in the FBS included earning a victory in the Famous Idaho Potato Bowl. Daly coached the Vandals’ defensive line in that 61-50 victory over Colorado State. The last two seasons, he has coached UI’s outside linebackers. He helped Kaden Elliss earn first-team all-conference honors in both the Sun Belt and Big Sky. He also helped Tony Lashley rank No. 5 in the country in solo tackles per game as a first-team All-Sun Belt pick in 2017. Daly also was part of a staff that helped Idaho become the first school to transition from the FBS to the FCS. He said that experience taught him from a recruiting perspective the important of understanding the nuances of partial scholarships available to FCS teams. The competitiveness of the Big Sky was also reaffirmed first-hand to Daly and the Vandals. Idaho went 3-5 in league play, 4-7 overall. Daly once was one of those football players. He said he remembers MSU installing sprint turf in Bobcat Stadium his senior year, a “really big deal at the time.” In 2010, MSU finished its renovation of the South end-zone, bringing Bobcat Stadium’s capacity to nearly 18,000 people. After the renovation, Montana State tore off three straight Big Sky titles for the first time in school history behind the play of McGhee and the pass rush ferocity of a defensive front spearheaded by Brad Daly, Bobby’s younger brother. Brad won the 2013 Buck Buchanan Award and is still among MSU’s all-time leaders in sacks with 33. Daly moved away from Bozeman six years ago. 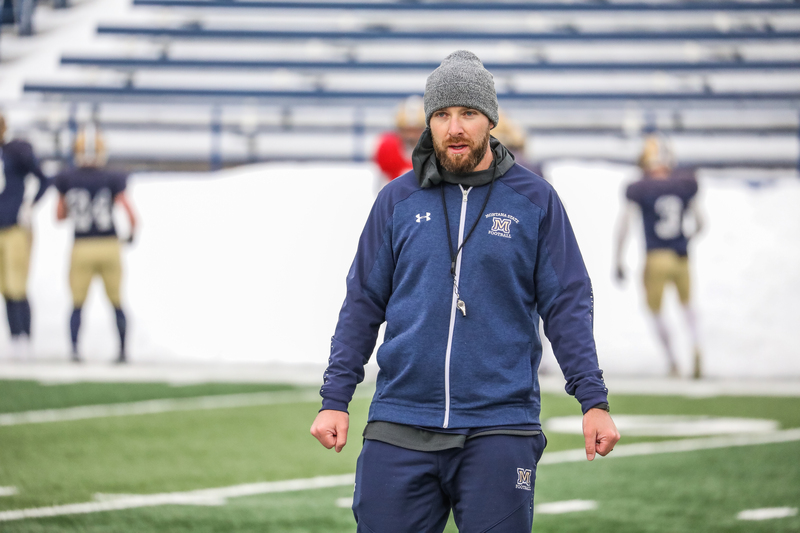 He hasn’t been officially part of the Montana State football program in more than a decade. A return to Southwest Montana puts him 90 minutes south of his parents and sister, all who still reside in Helena, and less two hours away from Brad, who lives in Billings. “I’m very fortunate and grateful to be back,” Daly said. “I was gone for six years and it was a great learning experience. Photos by Garret Becker – Montana State Football Director of Video Service, or R. Dean Hendrickson for Montana State. All Rights Reserved.